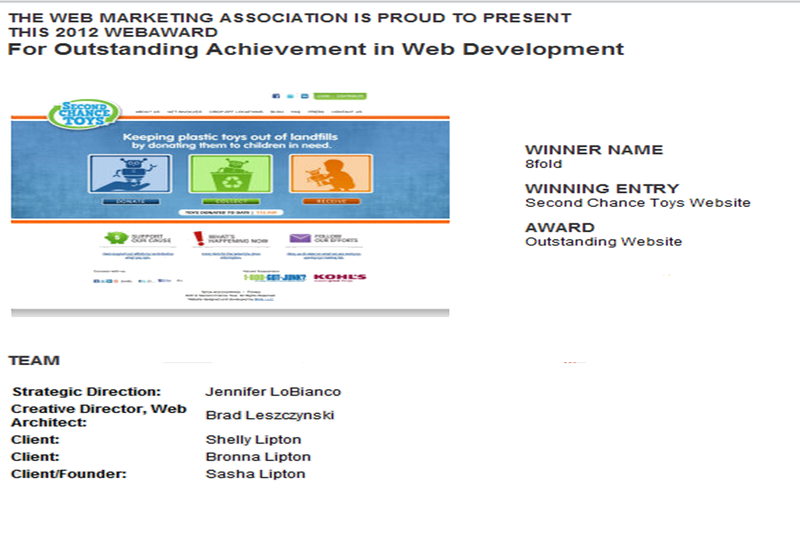 Congratulations to 8fold Integrated Creative Works for receiving the 2012 WebAward for Outstanding Achievement in Web Development! Second Chance Toys Shares New Way to "Get Involved"
Second Chance Toys has so many different opportunities for volunteers to jump in and get involved. 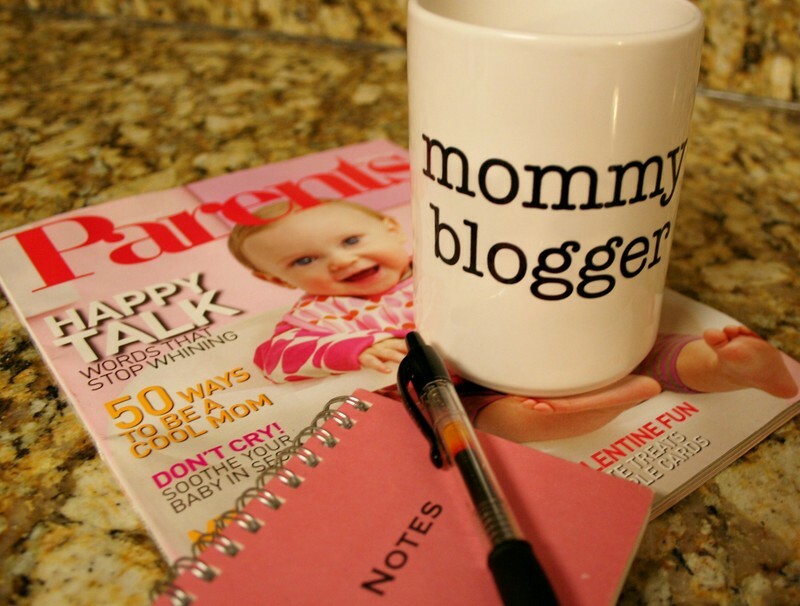 Click here to visit our "Get Involved" section and see the creative way that our Mom blogger supporters can make a difference! Homeless children around the area will be receiving used toys thanks to a joint effort by the Massachusetts National Guard in Milford and the Worcester County House of Correction. Over the past month, soldiers, airmen, prison guards, and employees of the two facilities collected 82 toys for children in need. They gave the toys to a New Jersey-based organization called Second Chance Toys, which gives them to various organizations. Second Chance Toys then handed the toys over to Horizons for Homeless Children, which will distribute them to local area homeless shelters. Horizons for Homeless Children began in 1988 to help homeless families educate and care for their children. On Monday, all 82 toys were lined up on display as representatives from the correctional facility, the National Guard, and Horizons for Homeless Children celebrated the effort. National Guard Brigadier General Gary W. Keefe said, "It’s going back to the Milford area." "It gives us a chance to show that we get involved with organizations such as Second Chance," he said. Luis S. Spencer, commissioner of the Massachusetts Department of Correction, said, "We all have kids. We have a wide variety of folks who work in the organization. Whenever we can give back to people that wouldn’t normally have that opportunity, we find it in our hearts to do so." This was the second toy drive by the local National Guard. The last one was in April when the guard collected 60 toys. "This time we had the Department of Correction," said Del Cournoyer, administrative assistant for the National Guard in Milford. Cournoyer, who has worked at the National Guard in Milford for 30 years, began the initiative after his daughter Jennifer Cournoyer, who is the operations manager at Second Chance, approached him with the idea last March. He said his daughter often witnesses children receive the used toys that the organization collects, an experience she shares with him through pictures. "The look on those kids faces is absolutely amazing," he said. "One toy will mean a lot to you when you have nothing." After getting the OK from National Guard command later that month, he started putting up fliers around the building and sent emails to the entire staff informing them of the initiative. Soldiers and workers responded enthusiastically, collecting the 60 toys in a month. After an outpouring of support and a willingness to participate by the Department of Correction, the National Guard decided to put on the latest toy drive. Now, a third drive is set to take place in November. "We are absolutely delighted to collaborate with the National Guard and the Massachusetts Correction," said Amy Whitehead-Pleaux, Playspace Programs regional director at Horizons for Homeless Children. She said the toys will likely go to children at the Medway Family Shelter and another undisclosed area shelter. "It is wonderful! We are thankful for their generosity and care," she said. Keefe said the program shows that the National Guard does not just serve the community by helping people recover from hurricanes and tornadoes. Derek McLean can be reached at 508-634-7582 or dmclean@wickedlocal.com. 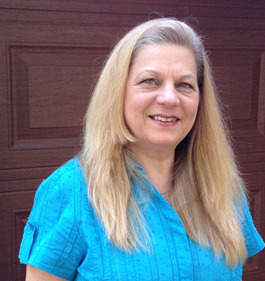 AnnMarie Arlington has been a great supporter of the Second Chance Toys mission. She has volunteered her time at many different SCT collections by bagging, tagging and cleaning the toys. As a crafter and seamstress, AnnMarie is a big advocate of not being wasteful. She uses recycled materials to create her projects and always tries to reuse materials in any way that she can. 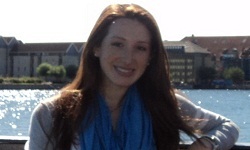 Thanks AnnMarie, for helping children, the environment and our team members here at Second Chance Toys! Founded in 2006 by Northwestern University student (and now college graduate) Sasha Lipton, Second Chance Toys is a non-profit organization dedicated to salvaging toys for children in need. Twice a year, the movement collects unwanted toys, primarily through city landfills, and donates them to community organizations. Q: Where did your vision for Second Chance Toys come from? The idea initially came about at my home in New Jersey, where towns collect garbage once a week. Bigger items are left on the curb to be taken away, and while I was driving around with my Mom, I noticed how many toys were being disposed of. Many of these toys were good as new, and I began thinking about how they would just be going straight into a landfill. Not only did I realize how bad this was for the environment, but also how many kids in need would love to have these toys. Q: How did you get Second Chance Toys up and running? I literally began by power-washing toys in my backyard, and then researching places that would accept them. Little by little, the donations were accepted, and I was able to send the toys to several different areas. In terms of receiving capital for funding the startup,my parents were definitely the primary source; they paid for everything, including legal fees. Q: As a college student running an organization, it must have been difficult to keep everything in check. How did you balance your workload and other obligations? Overall, my role has changed as the organization has grown. When Second Chance Toys first started, I was physically cleaning the toys and making each donation to the organizations. Now, because of the partnerships that we have, and the way that Second Chance Toys is situated, I don’t have to physically be there for everything; I’m able to offer my opinion and ideas through video conferences or e-mails. My role is primarily oversight, so in terms of balancing everything, I just make sure to prioritize what is important. Q: What were some of the challenges you faced as a young entrepreneur trying to gain recognition? When I first started, a lot of organizations felt uncomfortable with a young teenager calling them up, and trying to donate toys that had already been used by other children. Once I found an organization that would accept the toys, my story was put in the local newspaper. That exposure made what I was doing seem legitimate to others, prompting them to come forward and also accept toys. Q: What has been your best experience since creating Second Chance Toys? Just being there to donate the toys in person, and getting to meet the children receivingthe toys, has been great. A lot of these kids come from families that can’t afford to buy toys. They are always so excited, and often are in disbelief that the toys are for them and that they can actually take the toys home. It is extremely rewarding to think that if it not for Second Chance Toys, toys that would be sitting in landfills are instead bringing smiles to countless children. Q: In turn, what was your toughest experience? How did you stay motivated to keep going? It was very discouraging at the beginning. I was cleaning all of these toys, and even though they were as good as new, no one wanted to accept them because they had been used. I remained positive, and figured that there had to be someone out there willing to take the toys in. 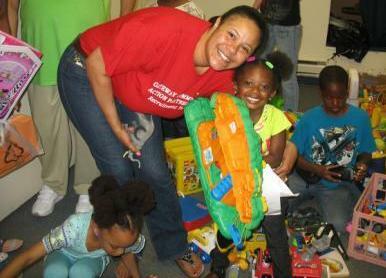 Eventually I found an organization in Newark that was willing to accept the toys. Q: Is there anything else about Second Chance Toys that we should know? As a nonprofit organization, we are always growing. We’re currently looking for corporate sponsors, especially one that produces cleaning and disinfecting wipes. It would be great to partner with a company that could be the official wipe of Second Chance Toys. Q. What advice would you offer to others who are looking to follow in your footsteps? Don't give up when challenges come your way. If you believe in yourself, and are determined to make a difference, any idea can become a reality. 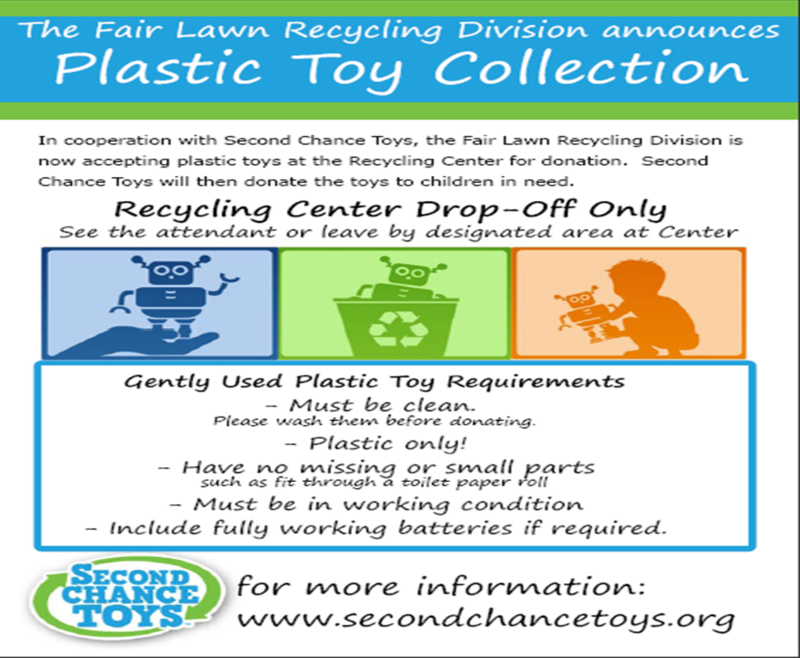 The Fair Lawn Recycling Center has joined forces with Second Chance Toys, a non profit organization that rescues and recycles gently used plastic toys for children in need. Rather than tossing the toys your child has outgrown, you can drop them off at the recycling center where they'll be provided to Second Chance Toys, who will save them from the landfill (think Toy Story 3) by distributing them to local community organizations where they can enhance a child’s development by helping promote socialization, creativity, emotional security, motor skills and learning. This is a drop-off program only, so the Recycling Division will not collect these items at the curb. Please help support this program while helping to reduce the amount of materials going to the curb for garbage collection. Paulsboro Head Start Family Advocate Aja Alston and student Asianay Bryant share the excitement of the toy distribution while other children check out the toys. 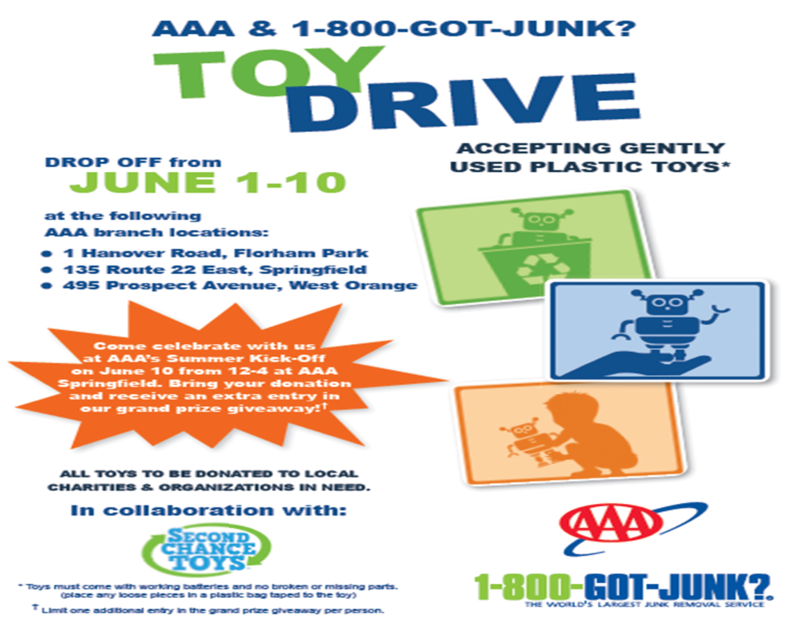 Second Chance Toys and 1-800-Got-Junk? partnered to make children at Gateway Community Action Partnership's Paulsboro Head Start center very happy one Saturday morning in April. Second Chance Toys, which rescues and recycles gently used plastic toys and donates them to children in need, donated a truckload of toys to Gateway's Paulsboro Head Start on April 21. 1-800-Got-Junk?, the world's largest junk removal services, donated their services by delivering the toys. From there, Gateway staff distributed the toys to our Paulsboro Head Start children, who were thrilled to start playing with the toys. Hilltop Elementary School Library Media Center and Second Chance Toys teamed up during Earth Week in an effort to make a meaningful difference within the community. Over 100 gently used plastic toys were donated to children in need at Morristown Neighborhood House and Head Start of Morristown, NJ. The students arrived at the after school event with their stuffed animals and two or more plastic toy donations. They participated in song, poetry, stories and movement as they prepared to tuck in their animals for the night. These creative volunteers combined helping their underprivileged peers with a fun and educational event. Great work! 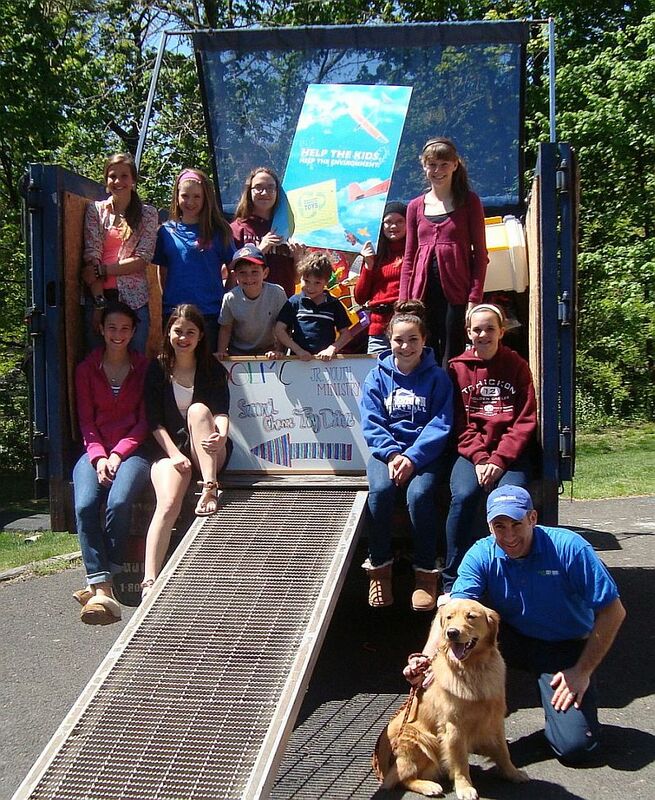 Over 12,000 Toys Collected and Donated to Children in Need During Earth Week 2012! Second Chance Toys continues to reach new milestones with the help and dedication of our volunteers. BIG thanks to 1-800-Got-Junk?, Kohl's, New York Kids Club, Chris Canty and all the families, schools and community groups that held toy drives. With all of our combined efforts we are making a big difference in the lives of children and the environment. Keep up the good work! Unsubscribe from: Blog item: Over 12,000 Toys Collected and Donated to Children in Need During Earth Week 2012! Once again, the Youth Ministry Group at Our Lady of Mount Carmel Church in Doylestown, PA came through in a big way for Second Chance Toys. 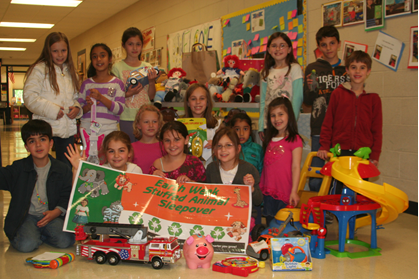 The group conducted a very successful toy collection on Sunday, April 29 in celebration of Earth Week. This is the fourth year in a row that they have made it happen for hundreds of deserving children in our community who will benefit from a truckload of beautifully shined-up, gently used plastic toys.Thanks to this great group of kids and their leader, Laurie Frayne, who have supported us so well for so long! It was a sunny Sunday, made sunnier by your charitable spirit. Way to go, all! Thank you very much for you efforts! Nolia Design brought Second Chance Toys to Colorado by holding their own Earth Week Toy Drive. Natalie White, owner of the full-service ecological design firm, discusses her experience below. What attracted you to Second Chance Toys? This past holiday season I planned to collect my families used toys and those of my friends to donate to kids in need. I struggled to find a local agency that would accept used toys. I did not want to dispose haphazardly of my family’s toys, as many used toys are good as new--then I stumbled up Second Chance Toys. Their outreach abilities and mission were inspiring. 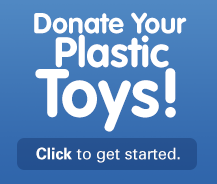 Why is collecting gently used plastic toys important to you? 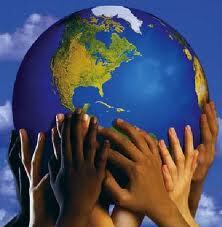 I am deeply concerned about the state of our environment and our children. I feel that teaching young children to give up something they care about for another child of less fortune is an epic childhood lesson. Of course, the proliferation of plastic toys is astounding, and re-allocating them is a wonderful re-use strategy. What role did your company, Nolia Design Inc., play in the collection process? Nolia Design Inc. facilitated the toy drive by collaborating with local businesses that generously allowed us to set-up in high traffic areas around Fort Collins. We created eye-catching Earth Day displays using tables covered with sod and plants in our collection sites, added large collection boxes and crayons for kids to draw with, and provided educational materials, wildflower seed packets and coupons from our business sponsors. To promote the event we sent out several email campaigns, created a Second Chance Colorado Face book page, posted the event on our website, and sent out press releases to regional newspapers. What was the best part of collecting for Second Chance Toys? Knowing that every single toy makes a difference in a child’s life, particularly those who have no toys or very few. With the first toy collected, we considered the drive a success. Do you plan to hold another Second Chance Toys collection? Yes, the team at Nolia Design has begun planning for our Holiday drive. We plan to collaborate with sponsors to place them in businesses, pre-schools and other kid friendly sites. We hope our partners will use their networks to promote the drive, and leave the bags on site for a couple of weeks to facilitate collections. 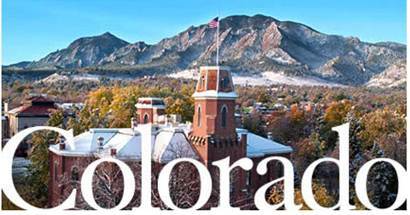 We are also planning to expand our scope beyond Fort Collins to include Boulder. Additionally we may work with another non-profit that has a large used children’s sale every fall and collect their un-sold plastic toys. If you had to give one piece of advice from your experience to other collectors, what would it be? Integrate the collection sites into the daily routines of families or other possible donors. Instead of having narrow collection windows for just a couple of days, try to maintain the collection sites for longer periods. 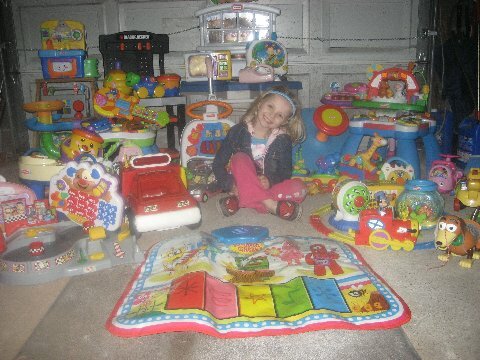 Crystal Zak held her first Second Chance Toys Collection this month in honor of Earth Week. She has been working along side her two daughters to collect toys and make a difference. Below, Crystal shares the story behind her own Second Chance Toys mission. My daughters, Haley (4) and Lily (2), have so much and have even bigger hearts. We were inspired by Earth Week because Lily was born on Earth Day, so each year we try and celebrate her birthday in a special way. Haley came up with the generous idea to donate the toys they no longer played with to kids in need. She was very excited to help collect and clean all her old toys. We donated to the local shelter, Hilltop Haven in Paterson, NJ. Haley was very excited to see how much her toys meant to some of the children we saw that day. Even though Haley and Lily are too young to understand their generosity, it melted my heart that I raised such caring kids. 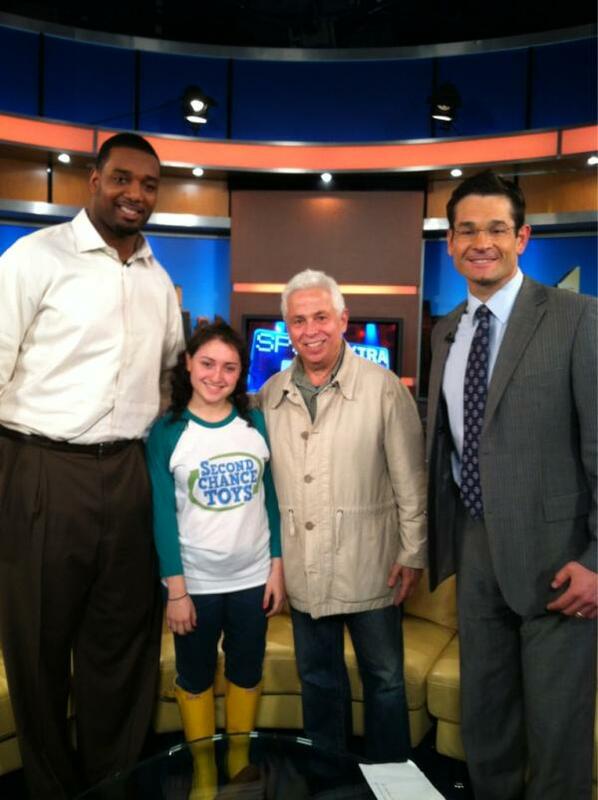 On the set at Fox 5 Sports (left to right) Chris Canty, NY Giants defensive lineman, Jocelyn Goldberg and her Dad Alan Goldberg who coordinate major toys collections in the Big Apple, and Duke Castiglione, sports anchor for Fox 5. 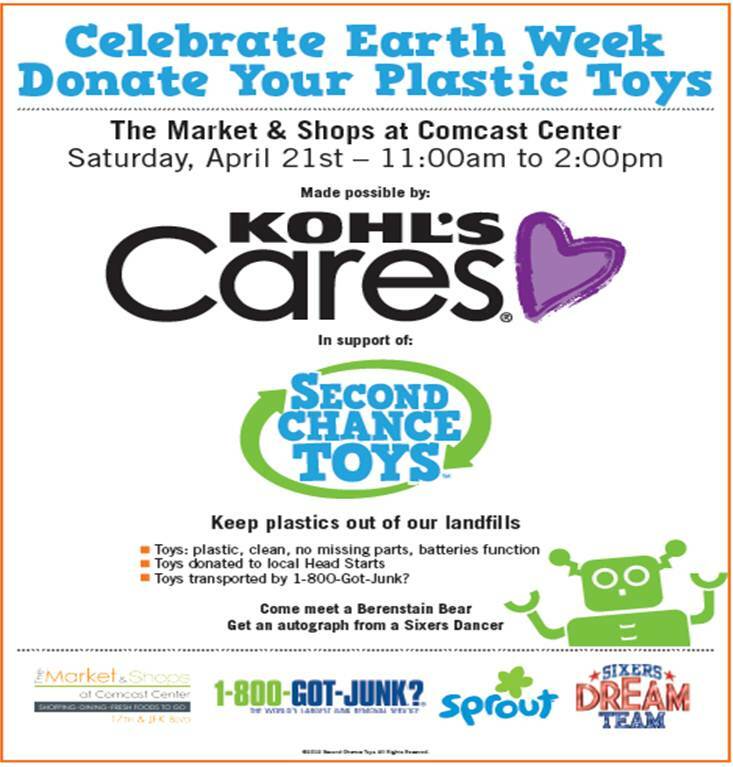 Kohl's Associate in Action showed their support at the Comcast Center in Philadelphia to celebrate Earth Week. Through the Kohl's Cares program over 6,000 toys were collected and donated to deserving children from Head Starts in the region. We can't thank Kohl's Cares enough for their dedication to our mission and support with a generous grant to help us continue growing in order to serve more children. Unsubscribe from: Blog item: Kohl&#039;s Really Cares! Thanks to Chris Canty for Turning Our Donation Into a Big Apple Event. Chris Canty of the NY Giants joined the Second Chance Toys including Sasha Lipton (founder) with the NYC team, Jocelyn and Alan Goldberg in a donation of over 500 toys collected at NY Kids Clubs in celebration of Earth Week. Toys were generously transported by our valued supporter, 1-800-Got-Junk? Unsubscribe from: Blog item: Thanks to Chris Canty for Turning Our Donation Into a Big Apple Event. Second Chance Toys now has an amazing video to tell our own ‘Toy Story’ and we're excited to share it with you. We hope you like it and feel compelled to share it. Jennifer Cournoyer joined Second Chance Toys as the Operations Manager a few months ago and has been busy helping donors, collectors, and recipients for our Earth Week programs. She recently participated in her first hands on toy drive with SCT and below recounts her very special experience. 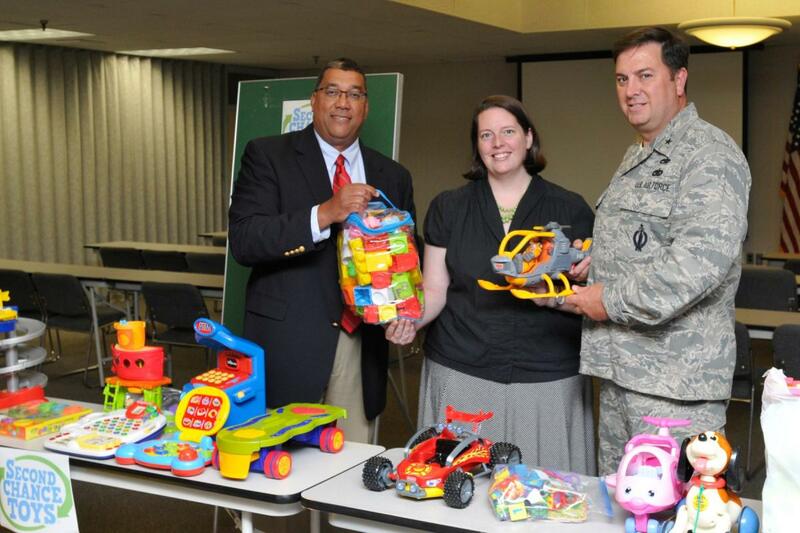 The Earth Week Toy Drive at the Massachusetts National Guard Headquarters went perfectly! 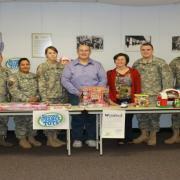 The Soldiers and Civilians collected 60 beautiful toys and were able to donate them to some very deserving children. Debra Vanderwerf, the Central Region Director for Horizons for Homeless, met us at the headquarters in the afternoon. She was so grateful and took half of the toys for the homeless newborns-8 year old children that her organization serves across Massachusetts. After Debra left the headquarters we drove to the women's shelter a few towns over, Serenity House. When we walked in with the toys we were greeted by a handful of women who reside there, along with two of their adorable babies. As I was kneeling down to unload the toys out of the boxes, a woman tapped me on my shoulder and said words that I will never forget. "Do you know who sent you here?" she asked. "Yes, I work for Second Chance Toys." She paused for a moment, looked at me and smiled, "No, God sent you here." It was such a touching moment, and one of the nicest things anyone has ever said to me. My first experience with a Second Chance Toys toy drive was surely one I will never forget, and I can't wait to be a part of many more.